TEDxTilburg. Delivered on April 6, 2019. This is the provisional text. Once the video is available, you will find it here. I was eight years old. At our school, a poster hung on the wall, much like this one. A globe with a lot of people that were falling off from all sides. The message was clear: the earth has too many people. We must stop multiplying as quickly as possible. There is just one cake, the more people eat from it, the sooner the cake will be gone. That was 50 years ago. Meanwhile, the world population increased from 3.6 billion people to 7.6 billion. So, no less than 4 billion people were added to the world population. The fear that things are heading in the wrong direction has certainly not disappeared. And the message is still the same. Soon we will hit our planetary boundaries. The world population must shrink. But for the time being that will not happen. The United Nations project that the world population will grow by at least 3 billion people this century. So, you wonder where they should go, because the world is already so full. That is how I thought about it as a schoolboy in the 60s and as a student in the 80s. But I changed my mind. I am quite hopeful that we can take good care of the next 3 billion people that will join us on planet earth. In fact, I even think that they will help us to make the world a better place. And I will tell you why. And from classical antiquity to today, the argument is always the same: There will be scarcity. The cake is too small. There is too little for all those people. Not enough clean water to drink. There is not enough nature to enjoy. Not enough food to eat. We will have more hunger and poverty. So, there will be war and violence, because a hungry man is an angry man. There was another reason why I changed my mind. People who raise the alarm about population growth often advocate horrible measures. Tertullian wanted to reduce the world’s population through pestilence, famine and war. At the end of the 18th century, the British reverend Thomas Malthus advocated starvation and the spread of malaria among the poor to combat overcrowding. And in our time, American environmental activist Paul Ehrlich, author of ‘The Population Bomb’ suggested that we should add poison to tap water to make women infertile. It didn’t stop with intentions; some ideas were implemented. In the 19th century, during devastating famines in the British Empire, Ireland and India, the British government did not intervene, because it wanted to push back population in its colonies. For the Nazis, the lack of “Lebensraum” for the Germans was one of the reasons to kill millions of people. And during China’s one-child policy millions of women were forcibly sterilized and at least 336 million children were aborted. What finally made me think, was this cartoon. We know this is nonsense, but how should we envision the 7.6 billion people on this planet? Imagine that we gather all the people in the world as close to each other as the people in this picture. Let us say that each person occupies one square meter. How much space do we need? Do these 7.6 billion occupy the surface of France? Of Europe? Or China? No, of course not. Put 7.6 billion people on 7.6 billion square meters, and you need a bit more than the area of ​​two Dutch provinces – Limburg and Brabant. The remaining ten provinces of the Netherlands, and the rest of the world, are completely human-free. I realize, of course, this is completely nonsense too. Of course, we need much more space. We also want to live, travel, work, teach, grow food, ride a motorbike, swim, go to pop concerts and walk through vast forests. Moreover, we want more nature and a more biodiversity. But by visualizing the world population this way, you can see that all this is still possible. Now let us have a closer look at Tertullian’s complaint, and that of his predecessors and followers. Is it not true what they say? Is population growth not leading to more scarcity? After all, we have one big cake. When more people eat it, it will be finished sooner. So, if the number of people increases, all of us will have a bad time. Fortunately, we can check that claim. And then we find that the opposite is true. Throughout the centuries, the world did not become a worse place, but a better place to live in. We have never made greater progress than in the past century, when almost 6 billion people joined the world population. Imagine that we would not live in 2019, but in 1919. In the era of our grandparents or great-grandparents, when world population was less than 2 billion. So let us go back. In 1919, about 80 percent of the world’s population lived in extreme poverty. Today, it’s about 10 percent. In 1919, life expectancy worldwide was under 40 years. Today, Life expectancy is 72. In 1919, one in 3 children died before their fifth birthday. Today it’s one in 25, worldwide. In 1919, a terrible disease like smallpox killed millions of people. Smallpox killed more than 300 million people in the 20ths century. That was twice as many as the victims of all the wars combined. Today, smallpox is completely eradicated. I know, these are cold figures, but the suffering that is hidden behind these figures such as infant mortality, is unimaginable. Climate change was not yet a topic in 1919. As we know, climate change can worsen floods, droughts, storms and heat waves. You might think that such weather events were not an issue by then. But they were. The climate was much more deadly in 1919 than it is today. In the 1920s half a million people died each year from droughts, heat waves, floods and hurricanes. Last year, there were about ten thousand weather-related deaths. The reason is that we, worldwide, but certainly in the rich part, have started to better protect ourselves against the dangers of the weather. We’ve constructed strong houses, we’ve built a resilient agriculture, dikes, shelters, and early warning systems. Because the number of victims fell sharply and the population grew strongly, chances of dying from a climate-related event, fell by around 98 percent. Oh well, I could go on for hours. We could also talk about the emancipation of women and sexual minorities, about the decrease of the death penalty, of slavery and torture. Or the fact that for the first time in history, and at a fast pace, we begin to protect endangered species and nature reserves. The World is bad, but the World is better. 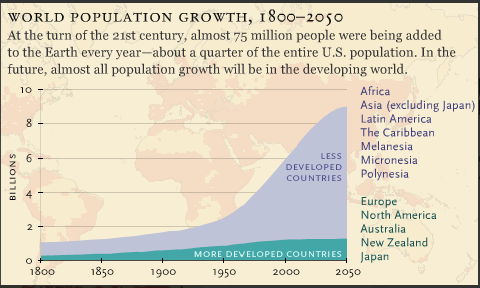 Perhaps the rapid population growth of the past century is even the best proof of human progress. Why? The world population did not grow because people gave birth to more and more children. It began to grow when we kept those children alive. We did not breed like rabbits over the past hundred years. No. We stopped dying like flies. When you read the newspaper, you may think that the world is in a dramatic state. But when you look at the data, especially when you look back at the past 25, 50 or 100 years, you see a progress that was unimaginable at that time – let alone in the time of Tertullian. That tremendous progress didn’t take place despite a population growth of six billion people but because of that population growth. Men like Tertullian, Malthus or Ehrlich told us that there would be too many mouths to feed. That there would be too many bodies that need space. That all those people would be eating the cake completely. But what they didn’t realize, was that there would also be more brains to think and hands to act. Of course, it is true that more people eat the cake. But they also add things to it. The cake we eat now is not only made of flour, yeast and milk, but also of eggs and sugar, nuts and almonds, fruit and spices, chocolate and cream. These ingredients make the cake bigger and fuller, and they also make it a whole lot tastier. That does not mean that we can simply lean back. It is, of course, a major challenge to accommodate the next 3 billion people. Because nature is under pressure. Because 10 percent of the current world population still lives in extreme poverty. Helping them to escape from poverty and hunger should be our priority. But history tells us that we can restore biodiversity, that we can reduce poverty and cope with population growth. After all, our capacity to solve problems also grows when the population increases. A few minutes ago, we went back to 1919, the era of our grandparents and great grandparents. Now we will jump to 2119, to the era of our grandchildren and great-grandchildren. One day they sit together and look back at today, at our time. Someone asks this question: would you like to return to 2019, to the time of your grandparents and great-grandparents? Perhaps someone then gives the following answer: No, I wouldn’t go back. 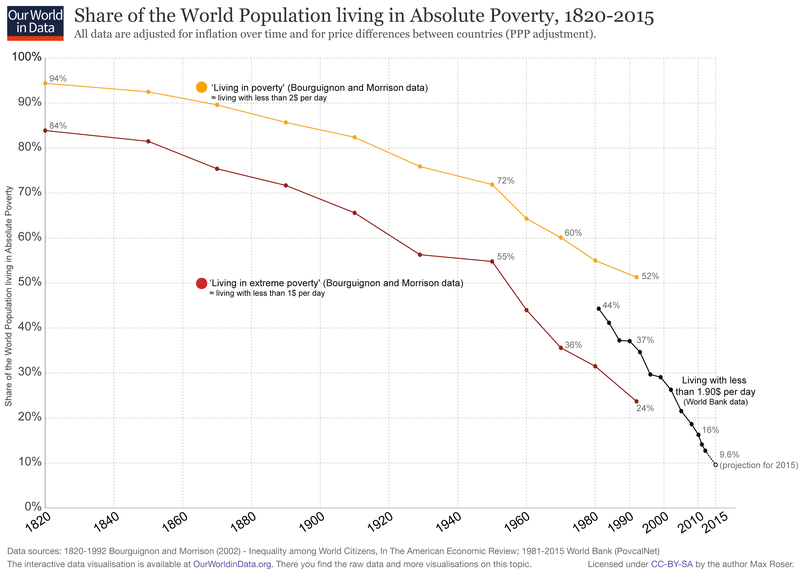 Do you realize that at that time, the days of Ted Talks and Netflix, 10 percent of all people still lived in extreme poverty? That there were still fatal diseases such as Ebola, malaria, Alzheimer, AIDS and cancer? That we had no answer to climate change? That global life expectancy was only 72 years? That 1 out of 25 children died before their fifth birthday? That terrible wars were fought in the Middle East and that Africa was just at the beginning of its economic boom? And perhaps she even adds this: in 2019 there were only 7.6 billion people. That was just not enough to properly solve those problems.